Every year, one of the most anticipated wine events is the Gambero Rosso Tre Bicchieri World Tour. This premier Italian wine showcase features the wines that have garnered the coveted “tre bicchieri” (or “three glasses”) award. Gambero Rosso is the world’s foremost guide on Italian wines, and their team of 70 experts and dedicated wine tasters spend six months each year visiting every region in Italy. They taste more than 50,000 bottles of wine in blind tastings and give a score to every wine. One glass is a good wine; two glasses is a very good wine; three glasses is an exceptional wine. The recipients of the tre bicchieri award are in the annual Vini d’Italia guide, which has been published since 1988. Out of 50,000 wines, 400 were given the award of three glasses. Quite a feat. But then, from these 400 wines, there are some special awards given. Ca’ del Bosco is one of the most famous brands in the Franciacorta region. It is also one of the most awarded wines in history with 40 awards in 30 years. While Franciacorta is a chardonnay-dominant region, the winemaker at Ca’ del Bosco chose to make this sparkling wine with 100 percent pinot noir grapes. The grapes come from old vines with high density and low yields and the wine shows elegance, strength, integrity and balance. This wine comes from Sannio, a hilly area north of Naples in the heart of Campania. Falanghina is an indigenous grape that dates back to the Romans in ancient times. This wine, with a brilliant greenish yellow color, an intense nose of flowers, peach and vanilla, and bright acidity on the palate costs only 10 euro, making it an excellent value. Schiopetto is a 50-year-old winery located in the north of Venice in the best part of the Collio terroir. The bright straw yellow wine with a nose of tropical fruit and wildflowers is fresh, crisp and bright on the palate, making this white wine shine. Located in the German-speaking corner of Italy, Manincor is a fully sustainable state-of-the-art winery that uses alternative energy sources, recycles in the winery and has zero impact and zero carbon dioxide pollution. The wine comes from a single vineyard and is rich and aromatic with mineral and tropical fruit notes and an herbal finish. Made from 100 percent Nerello Mascalese, this wine comes from the northern slopes of Mount Etna, located 3,000 feet above sea level. The 80- to 100-year-old pre-phylloxera bush-trained vines are grown on mineral rich soil. The resulting deep garnet red wine has notes of flowers and strawberries and a long finish. Ca del Baio is a small family winery owned by the Grasso family. This small but important winery located in the village of Treiso in Barbaresco, Italy, produces classic, elegant nebbiolo. Owner Giulio Grasso works in the vineyard year-round. With the assistance of his three daughters, Grasso never seeks outside help for something he can do himself. Guado al Melo was purchased by the Scienza family in 1992. The family revived the historical vineyards and is focused on producing Bolgheri wines that are natural and express their terroir. Their reserve wine is made with 60 percent cabernet sauvignon, 20 percent cabernet franc and 20 percent merlot. The result is an intense wine with aromas of spices, red fruit, licorice and a hint of peppermint. As the winery of the year, it received this award for more than just the quality of the wine, but also for the Allegrini family’s commitment to the region. Beginning with growing vineyards in the 16th century, Allegrini bought the property in the Valpolicella area in the 1970s. Allegrini has done a lot for amarone and Italian wines over the years. With vineyards in other regions in Italy, they have a clear vision and want to make great wine everywhere they go. The sweet wine of the year comes from a cooperative that purchases fruit from 120 growers in the area. The result is a wine with an intense golden yellow color and intense aromas of lemon and honey and great acidity on the finish. 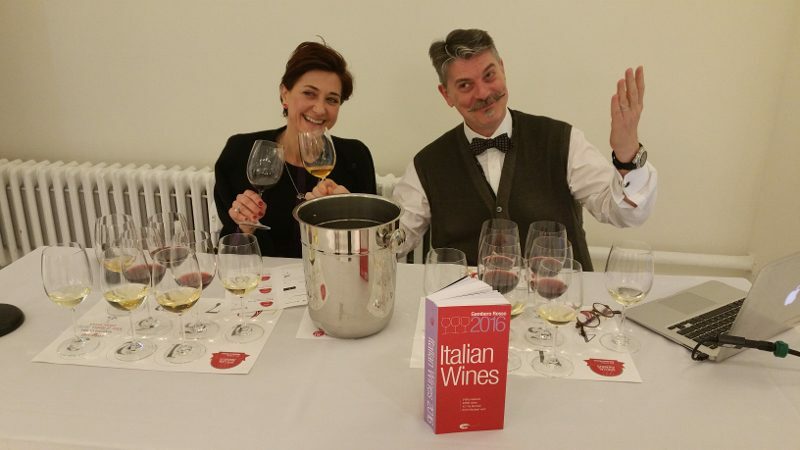 Now that the 2016 Vini d’ Italia, the 29th edition of the guide, is out and the Tre Bicchieri U.S. tour is complete, it is time for Marco Sabellico and his team to begin working on the 30th anniversary edition. This entry was posted in Wine and tagged Eleonora Guerini, Gambero Rosso, Marco Sabellio, Napa Valley Register, Special awards winners, Tre Bicchieri, Vini d’Italia, Wine by Allison Levine.